Greenlink, the public transit system operating in Grenville County, SC, has long failed to meet most riders’ (and non-riders’) expectations for mobility in the community. Greenlink staff and the Greenville Transit Authority Board, which governs the system, say that the service they can offer is limited by the funds they receive for operations. 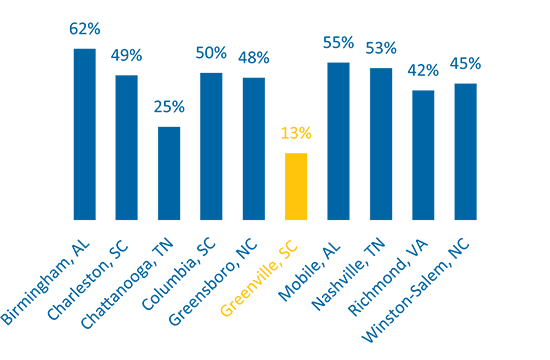 To better understand revenues for public transit in Greenville, the Piedmont Health Foundation conducted a revenue comparison study to compare Greenlink’s funding to transit systems in “peer communities” – areas in the Southeast that are similar in terms of population, geography, economy and culture. Source: 2015 Annual Database Revenue and 2015 Annual Database Service, FTA NTD. Source: 2015 Annual Database Revenue, FTA NTD. Source: TS1.1 - Total Funding Time Series. 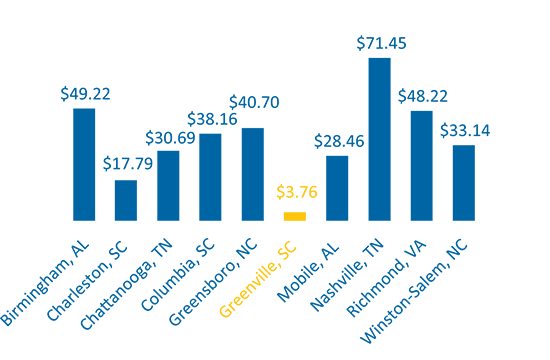 Local funds – from the City and County of Greenville – provide just 13% of Greenlink’s revenues. Greenlink receives $3.76 per capita from local sources. The next lowest peer community – Charleston, SC – receives $17.79 in local funds per capita. Local funding for Greenlink has decreased over time, from $730,724 in 1991 to $586,739 in 2015. But passenger fares at Greenlink, both in absolute terms and as a percentage of the budget, are comparable to peer communities. Greenlink staff and community volunteers are working on a more innovative and supportive system, one with more frequent service, longer hours, better coverage, and more oriented to the needs of employment, education, health care, and traffic reduction. Some modifications to the existing system can likely be made to reduce costs. But to develop a system that services Greenville in 2017, we will likely need local funding beyond what was provided in 1991.